In New South Wales during World War I, people who were born in countries which had become the enemy of the Commonwealth of Australia experienced unique hardships in the face of an increasingly hostile public, and under pressures from both State and Federal Governments. Many of these people and their relatives suffered challenges in merely surviving while the conflict lasted, with restrictions being imposed, employment becoming difficult, and the very real threat of internment lingering throughout the war. The term ‘alien’ commonly applied to any person who came to New South Wales from a country outside the British Empire (including even the United States of America). 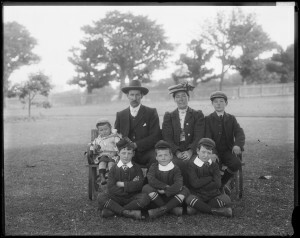 After having resided in NSW for a minimum of five years, these people could obtain the privileges and rights of citizenship held by ‘British subjects’ (e.g. voting, owning land) by becoming naturalised. 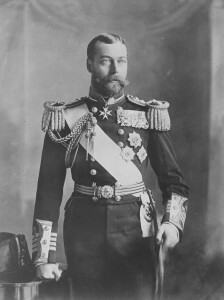 From 1904, this involved applying to the Commonwealth Government of Australia and, upon approval, swearing an oath of allegiance to the King who during the war was George V.
Any unnaturalised people born in countries which became the enemy of the British Empire (and Australia) during World War I, were labelled as an ‘enemy alien’. These enemy countries included Germany, Austria-Hungary, Bulgaria, and the Ottoman Empire (Turkey). The majority of enemy aliens were of German-origin. An average of 190 Germans and 23 Austrians were becoming naturalised each year in the five years leading up to the war (1909-1913), and in the year the war began (1914) these figures increased to 596 Germans and 64 Austrians being naturalised. It is likely that the majority of these occurred in the rush of applications during the first five months of the war between, August and December 1914. German immigration had been strong (compared to other non-British nationalities) since the assisted immigration schemes of the late 1840s, and the census of 1911 reveals that there were more than 33,000 people of German-birth living in Australia before the war. Taking into account the official Lutheran church member figures for the time, there was probably almost 100,000 people with recent German heritage resident in the country, including second and third generation descendants of German immigrants. German communities developed in NSW, particularly in rural areas such as the Riverina area close to the Victorian border. German immigrants also found work in cities, established businesses, and started families – often with Australian-born wives. By 1914, many German immigrants had been living in Australia for decades. Up until that year, Germany and Australia enjoyed a strong trade relationship, in which Germany was purchasing twice as much as she sold to Australia. Our wool and mining products were the highest exported goods to Germany, and overall 12% of NSW exports during 1913 went to countries who became enemies of the Commonwealth the following year. From 10 August 1914, a Federal Government proclamation was released, requiring all subjects of the German Empire to report to their nearest police station and provide personal details, including address and occupation or businesses, and to thereafter notify the Police of any change to these details. Four days later the same was required of those born in Austria-Hungary. This was followed by the War Precautions Act, introduced on 29 October 1914 to allow the Commonwealth Government to utilise public and private spaces as well as property to assist in the war effort; but also to control those that it deemed may be a threat to security. It potentially applied to all Australian residents, but was largely aimed at enemy aliens and naturalised persons alike, should suspicion be raised of ‘disloyal’ activity, for example. The Act’s regulations broadened over the course of the war to mean that enemy aliens could not travel interstate or overseas without permission from the Military, nor keep motor vehicles, cameras, telephones, most firearms, or even flammable liquids. Communication both overseas and locally was also restricted. Any breach of these regulations presented the threat of imprisonment (in internment in camps like those at Trial Bay and Holsworthy) and/or deportation. Whether a person was deemed to be a threat was essentially up to the discretion of the military, whether a breach had clearly occurred or not. The accused were not offered legal representation, nor were trials conducted to decide if a person was innocent or guilty. The tone of discussions both in public and in Parliament, began to change as early as September 1914. During that month, newspapers reported on ‘German atrocities’ allegedly committed by German soldiers in Belgium, as well as the first Australian casualties during the Battle of Bita Paka in (then) German New Guinea. 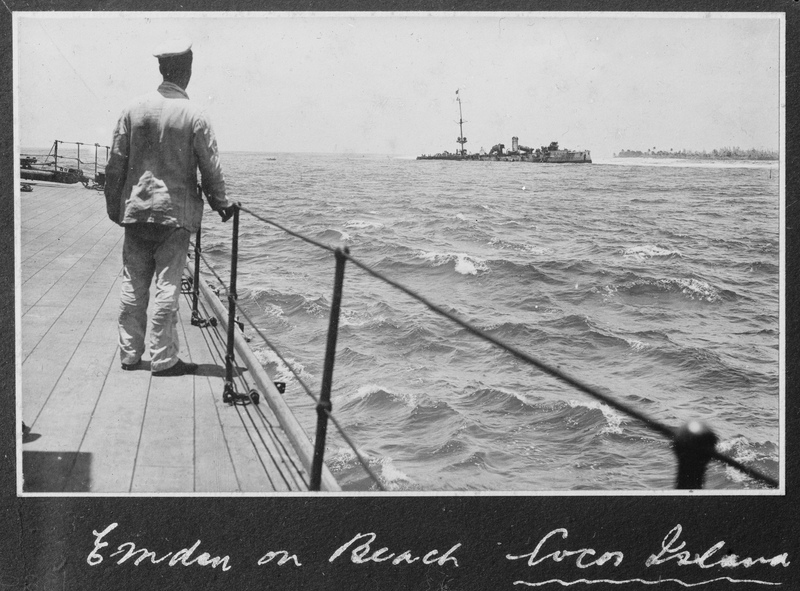 By November 1914, questions were being raised in the NSW Parliament about ‘Germans’ in the NSW public service, while the first major Australian victory occurred when the HMAS Sydney sank the German ship Emden. At the same time, an ‘Anti-German League’ was formed in Victoria, as well as the first internment under the War Precautions Act, which had been assented to on 29 October. From this point, anti-German sentiment intensified throughout Australia. It took various forms, such as anti-German letters being published in newspapers, along with calls for anti-German leagues to be formed and the boycotting of all German products – even names of people suspected of being enemy aliens were published. General anti-German propaganda material also began to be distributed, not only by members of the public, but by governments as well. This attitude was not aimed only at the German military or its leaders fighting the war in Europe, but at anyone or anything German in Australia. Pressure was placed on the NSW Government to increase restrictions on enemy aliens, and even on Australian-born people with German ancestry. Many called for all ‘Germans’ to be interned, whether naturalised or not, although the enormous financial burden this would place on the Government had been pointed out by the NSW Attorney General, David Hall. Many members of the general public, local councils, the NSW Anti-German League, as well as members of the NSW Opposition, all demanded the NSW Government dismiss any German-born public servants. Some citizens of German heritage (even those born in Australia) felt the need to change their name, often to an ‘anglicised’ variation, and several New South Wales towns adopted new names during the war. The experiences of many people of enemy country origin and heritage reveal a different perspective of the difficulties of life in WWI Australia. Many of these stories can be found in NSW State Archives. NSW Migration Heritage Centre. (2011). The Enemy at Home: German Internees in World War I Australia – The Camps and the System of Internment (web page). Retrieved from http://www.migrationheritage.nsw.gov.au/exhibition/enemyathome/the-camps-and-the-system-of-internment/index.html. Parliamentary Papers, 1915-1916, Vol. 1, ‘Germans and Austrians within the Commonwealth’. Scott, Ernest, Official History of Australia in the War of 1914-1918: Volume XI Australia During the War, 1936, p. 108. State Archives New South Wales, Archives in Brief 50 – German migration and settlement in New South Wales, 2003. McKernan, Michael, The Australian people and the Great War, Sydney, William Collins Pty Ltd, 1980, p.150. Fischer, Gerhard, Enemy Aliens: Internment and the Homefront Experience in Australia, 1914-1920, University of Queensland Press, 1989, p. 15; Williams, J F, German Anzacs and the First World War, University of New South Wales Press Ltd, 1983, p. 18. SANSW: NRS 12060, [9/4687], 14/1459, ‘Trade During the Year 1912 Between Germany and the Commonwealth of Australia & Between Germany and the British Isles’, p. 2. NRS 12060, [9/4687], 14/1459, ‘Trade During the Year 1912 Between Germany and the Commonwealth of Australia & Between Germany and the British Isles’, p. 1. NRS 12060, [9/4697], 15/1430. Fischer, p. 15; Williams, pp. 36-38. Sydney Morning Herald, 7 August 1914, p. 8. New South Wales Parliamentary Debates (Hansard), Vol. 55, 5 August 1914, Questions and Answers, ‘Courtesy to German Citizens’, p. 588. New South Wales Parliamentary Debates (Hansard), Vol. 55, 5 August 1914, Questions and Answers, ‘Courtesy to German Citizens’, p. 588. SANSW: NRS 10929, Copies of circulars, memoranda and circular memoranda sent, Police Department, 1913-1915, 7/6187, Circular Memo. 776, 11/8/1914. Fischer, G & Helmi, N, The Enemy at Home: German Internees in World War I Australia, Historic House Trust of NSW, UNSW Press, 2011, p. 20. NRS 10929, 7/6187, Circular Memo. 802, 14/8/1914. NRS 12060, [9/4745], A17/4293, enclosing ‘Manual of War Precautions, Second Edition’, 4/8/1915. Fischer, p. 66. 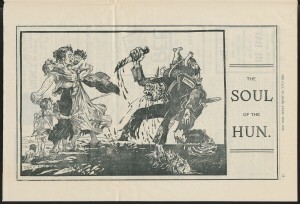 The Farmer and Settler, 10 September 1914, p. 1. Evening News, 12 September 1914, p. 1. Nepean Times, 7 November 1914, p. 3. Bean, C. E. W., ‘Official History of Australia in the War of 1914-1918, Volume I The Story of Anzac: The First Phase’, 1942; p. 106. The Bathurst Times, 2 November 1914, p. 1. The Independent (Deniliquin), 20 November 1914, p. 2. Williams, pp. 49-50. Selleck, R. J. W, ‘The trouble with my looking glass’: a study of the attitude of Australians to Germans during the Great War, p. 4 (Presidential address to Australian and New Zealand History of Education Society, Annual Conference, Trinity College, Melbourne, August 1979), in Journal of Australian Studies, (6), 2-25. Ibid, pp. 3-4. Williams, pp. 49-50. Fischer, p. 124. Ibid. 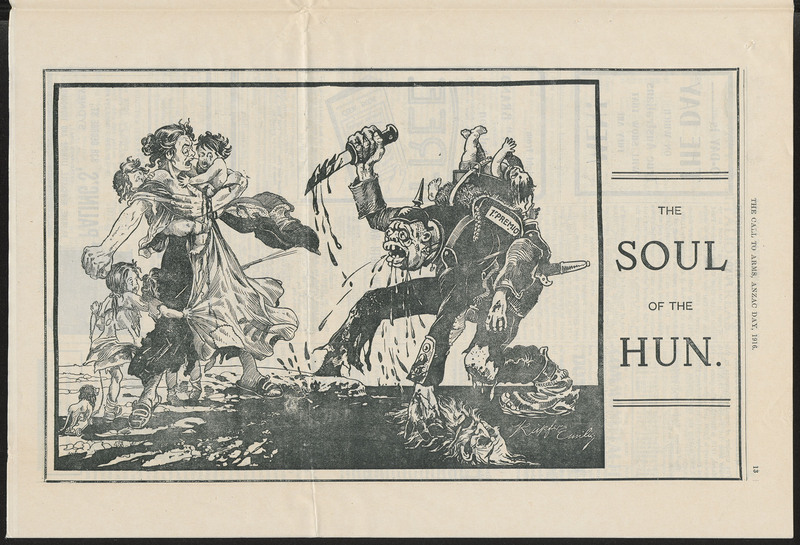 See examples in: The Call to Arms, Number 8, 25 April 1916; The Truth About German Atrocities. The Australian Worker, 27/5/1915, ‘Enemy Aliens: The Question of Internment’, p. 18. Parliamentary Papers, 1915-16, V5, pp. 787-788, ‘Petition from Certain Citizens of New South Wales, Regarding the Holding of Citizens’ Rights and Positions in the Public Service by Persons of Enemy Origin’, 14/12/1915; Parliamentary Papers, 1915-16, Vol. 5, p. 789, ‘Petition from E S Sautelle, Mayor of Vaucluse, and Certain Residents of New South Wales, Regarding the Holding of Citizens’ Rights and Positions in the Public Service by Persons of Enemy Origin’, 16/11/1915. NRS 12060, [9/4707], 15/8056. Sunday Times, 29/8/1915, p. 2, for example. New South Wales Parliamentary Debates (Hansard), Vol. 56, 11/11/1914, p. 1079, ‘Germans in the Public Service/Foreign Flags’. (For example, in the case of Ernest Ludwig Schultz, later Ernest McBryde) NRS 7953, [22/4367], 10/13990, enclosing 15/57496, 20/9/1915. German Creek (later Empire Vale), NRS 3828, Department of Public Instruction, Indexes and registers of letters received [Correspondence Branch], 6/382, p. 50; Germanton (later Holbrook), NRS 3828, 6/382, p. 52; German’s Hill (later Lidster), NRS 3828, 6/382, p. 51.